A while ago we learnt Max Anstie is out of Rockstar Husky by this seasond end. Today Jeremy Van Horebeek conformed he’s no longer Rinaldi Ysmaha next year. Rumour says JVH’s ride will go to Jeremy Seewer. Any idea who will replace Anstie? Any other news or rumours about next year? I have no clue. Who takes Ansties ride, Pauls Jonass? JVH to Wilvo Yamaha? Maybe Standing Construct KTM? I don’t think Searle has a ride for 19 secured. Maybe he stays with Dixon, but Dixon is really more into MX2. Remember now Jasikonis might end up at Rockstar instead of Anstie. He definitely needs off of that Honda! Curious to see where everyone lands. I heard the GP's are shutting down ....they all coming to the USA. Well Seewer is still under contract with yamaha so him to rinaldi makes sense. I've heard rumours of anstie to hrc on a 3rd bike. Coldenhoff confirmed he is out at factory ktm. So Pauls Jonass stays in the team but moves up to MXGP? I read somewhere that Brian Bogers injury was even worse than expected...so maybe no need for a third bike? Would think that Coldenhoff would slot in nicely on Strijbos' ride? Still a KTM and a team he has ridden for before. JvH is too good to not have a ride but not many spaces left. Swapping with Seewer looks like his best option at the minute. Yes that would make sense for Coldenhoff and Standing Construct. I hope we can see a official team from Kawasaki(MX2) and Suzuki again but I guess it's very unlikely? Simpson doesn't have a ride yet, can see him staying at Wilvo if he can tho unless JVH pushes him out. Seewer to Factory Yamaha makes sense, doesn't he have another 2 year with Yamaha Europe? I think he originally signed a 3 year deal? I can't see Jasikonis taking the Husky ride, Anstie is still beating him in the championship. How about Bobryshev is his contract up at the end of this? 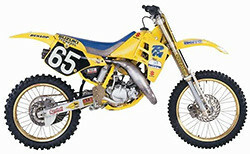 Maybe Coldenhoff to Rockstar Husky and then they have 2 strong riders all year round. It seems Jasikonis to Husky is a badly kept secret, I'm also a bit surprised Anstie is out. He did well 2017 and mxon to top it off. 2018 has been more troubles though. They both have potential I guess, and Jasikonis is perhaps cheaper but also more uncertain. I remember Simpson talked about enduro last time he was out of a ride. He would make a great beachrace rider, and doing brittish championship meanwhile. Maybe if he can find a deal like what Nathan Watson did I can for sure see him doing it. Yes it might be hard to keep IXS. Rinaldi is with Alpinestars I think. His contract is supposed to be with Yamaha and not Wilvo. I would pick JVH and even Simpson over Tonus. He is even more injured than Searle...I want to add I feel really sorry for both of them with their terrible luck. Lieber is assumed to stay at Kawasaki but is anything confirmed? No he has a deal with Yamaha Europe. They made the space for him on the Wilvo team. Probably true, but in all press releases they mention a 2 two year deal with Wilvo. "They have sort of told me that I think at the end of the year we are going to be parting ways. It is tough to deal with all those sorts of things. When you trust everyone around you and you feel so good with people, but it is business. I can respect their decision and what they are doing. Their plan is different from mine. So, at the moment, I am pleased I got on the bloody podium, because at least I have got something going for me at the moment. When you add that pressure to the mix, it gets more tough. When things are going well, it is easy to get good results. It is what it is. At the end of the day, I have got to just focus on my thing and myself and what happens, happens. I want to be back up there battling for podiums and try and put myself in a position where I can feel really good and on it like I did at the end of last year. At the moment I am just focused on the rest of this year and doing that." I don't know how someone could go with Jasikonis over Anstie. Husky getting rid of Anstie makes zero sense. Especially if they take Jasikonis as his replacement. The only way it would make sense is if they have an even better rider lined up for the spot(You could argue for JVH). Well JvH has clearly shown he was the better rider the past couple of years, but with Anstie and Jasikonis you stll have the potential upside that they may turn in to winners. JvH has shown that he is not going to be a winner in MXGP. Yes he has been vice-world champion but he has won exactly 1 moto in his MXGP career. He has been 5th, 6th, 7th and now 9th overall in the championship. Sign him, and you know what you are going to get: Nice finishes but no wins. The same applies to Coldenhoff. I could understand why a factory team would prefer a young guy over these veteran guys. Maybe the pricetag is smaller too? People forget the Jasikonis of last year, he was really good and strong on that factory Suzuki! People forget last year was his first full GP season! Before only a few wildcards and a fill in roll with Suzuki. I believe he is only 21 years to. Things are not really working out for him at Assmoto Honda, and i believe the bike is not on par with the Factory 450s. With a good winter a good team and bike like Rockstar Husky, he will be again a front runner in the sand and top 5 on hardpacks IMO. Rockstar Husky got 3 riders under the tent before, so with Anstie gone, they can pick Coldenhoff or JVH as good Second guy and Jasikonis as the darkhorse #3 on the team. Seems like a good and solid shot right? Coldenhoff isn't going back to Standing, no way. They stopped with the team last minute at the end of 2013 which made Glenn end up without a team. Despite all promises to Glenn they just stopped out of nowhere, so I don't see him going back there. Coldenhoff to (the Dutch) Wilvo Yamaha to replace Seewer makes much more sense. Jasikonis is partly still recovering from his winter injury but is also having a severe disadvantage in that his bike isnt up to par with his competition. Close sources denies any involvment with Rockstar Husky but my spider senses tells me thats just BS. Obviously they cant confirm anything at this stage since he´s still under contract. Well if I remember it correctly it happened a bit different. Coldenhoff signed with Suzuki with the intention to stay at Standing Construct as Standing Construct was negotiating with Suzuki to be the factory team. While these negotiations were taking place Coldenhoff already signed the contract. Then with the negotiations the team owner Mathys (who is a respectable guy) couldn't agree with the Japanese guys and declined the deal. In that way Coldenhoff was signed with the factory but without Standing Construct. Mathys went on to Yamaha and that is how they parted ways. No bad words or bad feelings to each other. I don’t see Husky going back to 3 riders. They dropped Nagl this year so they could go back to 2. It wouldn’t make sense to go with 3 again the year after. And if they do, it’ll be a kick in the teeth for Nagl. Standing was supposed to go to Suzuki in 2014 and Coldenhoff and Mathys agreed he would stay there. Then Glenn signed with Suzuki and all of a sudden Matthys did NOT sign with Suzuki and that left Glenn with a contract but without team. Glenn was NOT very happy with that. Fortunatly the German Bisschof Suzuki created a place for him otherwise he would end up wit a Suzuki contract but without a team. I know Standing continued with Yamaha and other riders, that's what even makes it worse. I know both Glenn and his mechanic Franky were pretty pissed off at that time and that's why I can't believe that Coldenhoff would return to the guy who pretty much f*cked him in the *ss. Well, regardless of what happened back then i don't think Glenn Coldenhoff is in a position to say no. You have guys like Bobryshev and Nagl relying on private sponsors for an income. I am a big fan of Coldenhoff, but he is very replaceable from a teams perspective.